Manuel Pellegrini’s Manchester City side lost their Champions League tie to Barcelona today, 0-2, in case you were hiding under a rock all day. One of the key factors (though certainly not the only one) was the penalty awarded to Barcelona just after halftime when Martin Demichelis took down Lionel Messi at the edge of the area. Replays showed it was just outside the area. Just. Good enough for government work. Let’s ignore for the moment what in God’s name Demichelis was doing defending Lionel FREAKING Messi in the first place, and focus on the post-game interviews, because that’s when $&*% got real. Pelligrini reacted the way most Premier League managers nowadays do when they lose. They cry like little babies. And then they blame the referee. Let’s just all take a moment to admire the pure and utter asshattery that is that statement, shall we? Let’s ignore for the moment that Demichelis was so beaten by Lionel Messi that he had no choice but to take him out. Let’s forget that, even if the penalty hadn’t been given for the contact (to which MP freely admits), City would have still been down to ten since it was denial of a clear goalscoring opportunity. In fact, let’s not ask what in the name of the sweet Baby Jesus DeMichelis was doing out there in the first place. Let’s also forget that Eriksson generously did not give a penalty when Gael Clichy obviously handled the ball in the box. Oh, or that Cesc Fabregas’ disallowed goal was actually not offside. OR that Navas dove like a Russian submarine on that imaginary foul of Pellegrini’s. Let’s forget all that, shall we? 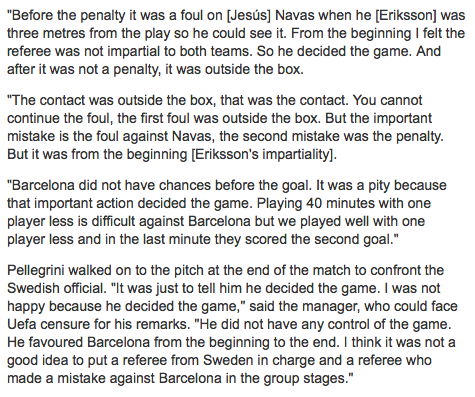 Jonas Eriksson had some sort of need to “make up” for a “mistake” against Barcelona in the group stages? You see where I’m going here: Eriksson, Eriksson, Eriksson, Eriksson. Not one word about his team, who missed plenty of chances, or his own highly questionable tactics. It was probably about 50/50 for each team, good and bad. That’s called impartiality. If by “no control” you mean he didn’t let Pellegrini’s squealing little prima donnas run wild, and didn’t give them all 3546 fouls they screamed for, then no, he didn’t have control. Yeah, that mistake? 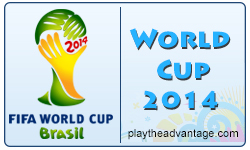 It was in the quarterfinals last year, not in the group stages, assclown. ::deep breath:: Okay, I’m finished. Love the cover photo Jenna! Although from what I saw quickly from Clichy’s contact was not deliberate handling no? I’ll have to review it. Isn’t that great? He has an awesome Angry Face. The handball wasn’t delineate to my mind and obviously to Eriksson’s. But if he’d been as horribly biased as Pelligrini said, wouldn’t he have given that one, too? You find some great shots of refs!